Add a little safety and sassy style to your wardrobe with our Med ID Purse Tassels! These playful accessories feature a soft leather tassel topped by a keyring, a stylish clasp, and a custom-engravable medical ID charm. Never lose your keys, always have your most important medical information at hand, and add a cute accent to your favorite handbag with our med ID purse tassels. Simply lock your door or turn off your car, and then clip your keys right to your bag! 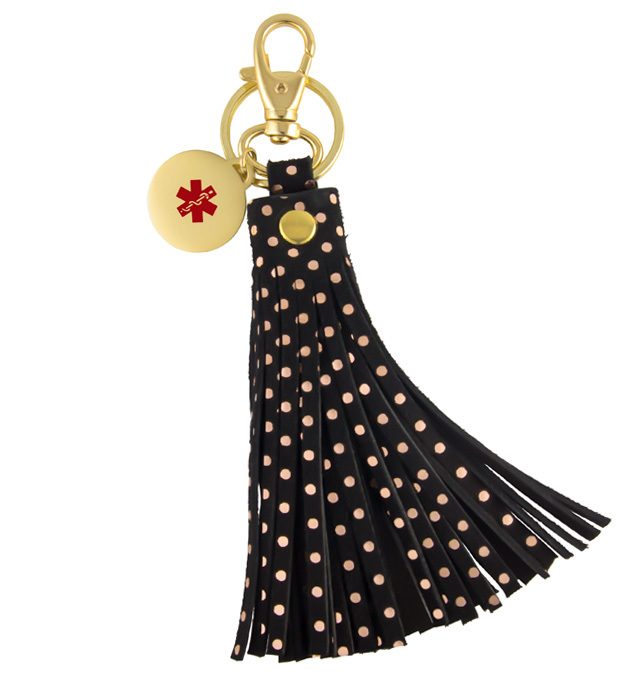 The Delaney Med ID Purse Tassel features soft strips of black leather with rose gold tone polka dots and a stainless steel grommet, keyring, medical ID charm, and clasp with a gold tone finish. With a large, lobster-style clasp (not a bulky carabiner! ), this med ID keychain is designed to open and close with just a gentle squeeze while staying put once affixed. The engravable med ID charm features a bold, red caduceus symbol on the front, which alerts first responders to your personal medical information, engraved on the back. Whether you or your loved ones wear a medical alert bracelet for weight loss surgery, food allergies, heart conditions, epilepsy, or any other medical condition or treatment consideration, Med ID Purse Tassels are an excellent addition to any med ID jewelry collection. Stylish and on-trend, these versatile accessories provide yet another way to communicate your medical information in an emergency.